While all eyes are trained at either the MB’s office or the Perak palace, in Ipoh’s Magistrates Court, warrants of arrests were apparently issued for Jamaluddin and Osman for their the latter’s no-show for their corruption trials which is supposed to commence today. According to their former lawyers (‘former’ – because they were so disgusted with the antics of the two, that they discharged themselves this morning), the two guys’ new lawyer told the court that they were ‘sick’. So their former lawyers SMS-ed over the news: That the judge issued the arrest warrant. Which goes to show – one should show better respect to the Courts, whether millionaire, pauper or politician. PS. Aren’t they both supposed to be at Kuala Kangsar, having tea and scones? I think part of the deal with Najib was the ‘promise’ of the withdrawal of their corruption charges. They took Najib’s bait hook, line or sinker not knowing that any withdrawal of charges by the MACC without adequate and reasonable explanation would go to show that there was such an offer made by Najib and that MACC could be directed by Najib. And if the above did take place, this would warrant another corruption investigation against the duo for agreeing to accept and Najib for promising a withdrawal of the charges as an inducement for them to do an act of defecting from their party. I suspect there was such a promise by Najib. That is why they confidently absented themselves thinking that the charges would be withdrawn. Lucky we have a timid MACC around. Otherwise this merit intensive investigation. No malaysian in his right frame of mind would believe that there was no offer of money, position or withdrawal of charges made to induce them to defect. Mo shee! Mo shee! 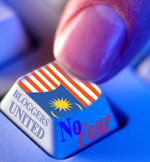 From now on, those who are with BN can do no wrong. The warrant is just for show only lah. Big brother Najib will take care of everything. Cannot afford to go back to HRH again lah. Now wonder they are so blatant in thumbing their noses at the court, MACC and the rakyat. Is it a RM5 mc? The doctor should be questioned and produce the examinations on Jama… maybe, he has cold feet! Is’nt it so obvious to the courts that these two ‘China Doll lovers’ are up to their monkey business? BN, the country does not belong to you low being bastards! The good judgment of the Sultan is now in question…making the palace a laughing stock in the eyes of the nation. What a coincidence both of them are unwell.Must be waiting for Najis instrutions??? i doubt…… just cant trust anything happened in Malaysia now! yes, check the defector’s mc & the doc too if he is able to attend the meeting at the palace ! the other toad without mc = NO excuse ! stern actions pls !! a quick open court conviction will barred the 2 (disqualify)from the state assembly. pakatan should now moved a motion of no confidence against the barisan ( appointed speaker ) & adopt anti hopping law in the state of Perak. The no-show is part of a ploy to ultimately drop the charges against these 2 crooks. The Courts and prosecution must now must prove their impartiality by arresting Osman straightaway and bring him before the Court. As for Jamal the veracity of the medical chit should be questioned. Otherwise the Rakyat will see the shenanigan of the whole episode. Fake MC’s. Check the Dr.
Its vomiiting to sense political blackmail /bribes & threats from Income tax Dept,Police etc can be used against political opponents. The MAJORITY of Perakians & Malaysians voted & supported MB Nizar & the Pakatan Keadilan-Pas-Dap led by Datuk Seri Anwar Ibrahim. Hidup Reformasi……..The Rakyat of Malaysia MUST NOT and CANNOT be bribed or cowed to accept Umno/Bn dirty tactics of gaining power against the wishes of the Majority of the Rakyat. Have these 2 defectors being played out by Najib? Or have they disappeared into the thin air like Bala after making the SD? Maybe, they have been advised to lie low until the shoe-throwing mood of the Perak people subsides. They can discharge the main actor in the Altantuya’s murder case, this will be peanut for them to twist the courts. Don’t put your bet on a conviction of these two low beings. I suggests MB Nizar to be the candidate for the by election in Bukit Gantang, Perak. If this is a reality, then, when he wins, it will be a big slap on the face for each and everyone in BN.